What Comes After You Say Yes? Your engagement is one of the most special moments of your life but what happens once you’ve said, not ‘I do’, but ‘yes’? Now it’s time to move on to the planning of the wedding! With the event quickly approaching (depending on the date you’ve set), it’s time to get things in order. And trust us, even if you have two years to plan your special day, it will go by quickly. At the end of the day, weddings are a lot of work. 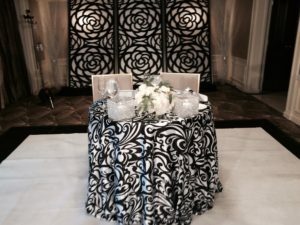 From finding your own dress, locating the perfect venue, selecting your bridesmaids and groomsmen, choosing the vendors and the event rentals, it can all get a little overwhelming. However, with some organization (okay, a LOT of organization), careful planning, and determination, you can plan this most wonderful affair effortlessly. It can even be fun! The first thing is whether you will be using a wedding planner or you will be the wedding planner yourself. That is truly your first big decision, and it’s definitely one to which you should give some serious thought. Most people use a planner but, then again, it depends on your personality type. If you are an obsessive type A planner, you may feel like no one else can do this job like you can. That’s valid and many people have done the same (some more successful than others). However, consider that wedding planners literally do this for a living, so they most likely have the talent and can provide added value. In either case, the decisions will likely be the same, but a planner will provide the experience, knowledge, and connections, freeing you up for more time to actually prepare for the wedding instead of having to pull it together all by yourself. Now for the important list of things to accomplish: the first step you will have to do is select a date. Along with this comes sending out your ‘Save the Date’ cards. When you select your wedding date, it may very well depend on the event venue. When you are able to book your wedding and when you want to book it are going to be the two biggest factors. It’s definitely key to check out your venue for the wedding and reception early, think about it, and make a choice about when you would like to get married. While you’re at it, you should also put some effort into researching the venue. You want to be 100% sure that the venue is going to have everything that you need, want, and again, need. You cannot cut corners in your research. Check them out online and in person. Get reviews or find out if anyone you know has had a good or bad experience there. Check online to see ratings of the venues and feedback. After all, you want a dream wedding, not a nightmare. If you work with a planner, choose one that knows what they are doing in booking vendors, figuring out rentals and more. And if you must do it yourself, stay organized and focused — binders for everything!